Samsung Electronics America, Inc. and M-GO, a premium digital video on demand (VOD) service and joint venture between Technicolor and DreamWorks Animation, announced the availability of its ultra-high-definition (UHD) content library on Samsung’s line of award-winning UHD TVs. This partnership brings a next generation content experience to Samsung UHD TV owners and represents the first UHD transactional video on demand streaming service to be launched in the U.S. 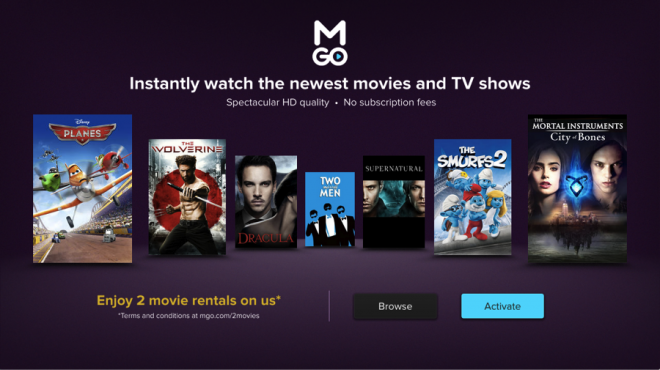 The M-GO 4K Ultra HD offering kicks off with a select number of titles and will quickly grow to 100 movie and TV shows by the end of 2014. UHD content will be priced on average at $1-2 more than HD titles to rent and $3-5 to buy. The potent combination of UHD content delivery on Samsung UHD televisions delivers a truly immersive cinema-like experience in the home. Exclusive to Samsung, M-GO 4K Ultra HD content will be available across the brand’s broadest line up of UHD TVs yet. Whether from an immersive curved TV or a super-sized 110” screen, Samsung UHD TVs will captivate home audiences with spectacular color, clarity and detail as it displays the incredible life-like picture quality of UHD content. Leveraging the unique heritage of its joint venture partners, Technicolor and DreamWorks Animation, M-GO’s UHD streaming solution provides high quality content that is either authored and post-produced in UHD, or pre-processed from licensed content partner source files and optimized for image clarity, detail and texture on televisions like Samsung UHD TVs.